Despite hurdles, the programme succeeded in bringing together youth from different tribes to promote peace in a refugee camp in Juba. In 2008, FIBA founded the International Basketball Foundation (IBF) to address the role of sports, in particular basketball in society, preserving and promoting basketball’s values and its cultural heritage. To fulfil this mission, in 2016, the IBF started using basketball as a tool to initiate positive change throughout disfavoured communities. The IBF believes that these ‘Basketball For Good’ projects can contribute to reaching the UN’s Sustainable Development Goals. That same year, the IBF partnered with Generations For Peace (GFP) to launch a three-year project in the capital of South Sudan, Juba, in an Internally Displaced Persons camp. With the support of the South Sudan Basketball Federation and the South Sudan Olympic Committee, a 3x3 basketball programme was put in place. Through this programme, the IBF and GFP seek to address inter-tribal conflict by bringing together youths from Dinka and Nuer tribes. The programme provides a safe space to play sport, but more importantly enables the youth from the two tribes to interact, break stereotypes and build greater tolerance, trust and understanding. The programme hit many hurdles at its beginning. Not only did the sudden bursts of violence in Juba stop the planned activities, but the communities in which the activities were to take place were strongly against it. GFP volunteers running the programme had lots of difficulties trying to convince the parents to allow their children to play with those from “the other” tribe; even the children were reluctant to come to the playing field. The community elders were persuaded that the programme had a political agenda, further fuelling parents’ fears. The lead GFP volunteer reported that the tribes’ elders did not want to speak with each other, leaving the volunteers—representatives of both ethnic groups and seasoned sport for peace practitioners—to think the programme should be called off. When the first basic activities finally started upon cessation of armed conflict, the young participants were only moving around and interacting within their peer groups as they were simply not ready to be at the same space with the youth from the rival ethnic group with whom they had fought beforehand. The sessions that were integrating peacebuilding education with 3x3 basketball activities were continuously adapted to fit the group dynamics and respond to evolving needs observed meticulously in each session. As the sessions progressed, so did their content, becoming more complex and inclusive. 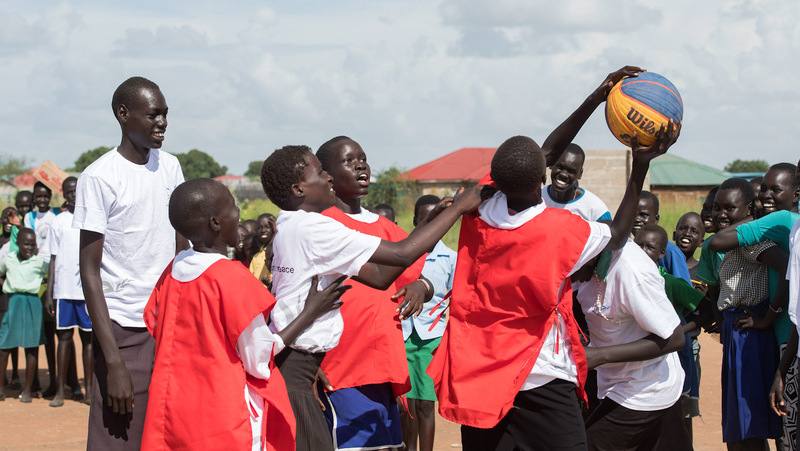 Some 18 months later, the first programme cycle was ended with a joint 3x3 basketball tournament engaging 180 Dinka and Nuer youth, in a community playground bursting with hundreds of youth and parents from both tribes cheering the young players. The participatory evaluation at the end of this cycle provided evidence of the programme’s success—an average increase of 45% in the people who reported they trust “the other”—as well as a guidance for the next cycle that is currently being prepared. This project is not only promoting peace and thus contributing to reaching the SDG no. 16: Peace, Security and Justice, but also addressing the refugee crisis.